Five pence and ten pence coins are legal tender only up to the sum of £5; this means that it is permissible to refuse payment of sums greater than this amount in 5p and 10p coins in order to settle a debt. The ten pence coin was originally minted from cupro-nickel (75% Cu, 25% Ni), but since 2012 it has been minted in nickel-plated steel due to the increasing price of metal. From January 2013 the Royal Mint began a programme to gradually remove the previous cupro-nickel coins from circulation with replacement by the nickel-plated steel versions. As of March 2014 there were an estimated 1,631 million 10p coins in circulation with an estimated face value of £163.080 million. To date, four different obverses have been used. In all cases, the inscription until 2015 was ELIZABETH II D.G.REG.F.D. 2013, where 2013 is replaced by the year of minting. In the original design both sides of the coin are encircled by dots, a common feature on coins, known as beading. As with all new decimal currency, until 1984 the portrait of Queen Elizabeth II by Arnold Machin appeared on the obverse, in which the Queen wears the 'Girls of Great Britain and Ireland' Tiara. Between 1985 and 1997 the portrait by Raphael Maklouf was used, in which the Queen wears the George IV State Diadem. On 30th September 1992 a reduced size version of the 10 pence coin was introduced. The older and larger version of the coin was withdrawn from circulation on 30th June 1993. The design remained unchanged. From 1998 to 2015 the portrait by Ian Rank-Broadley was used, again featuring the tiara, with a signature-mark IRB below the portrait. As of June 2015, coins bearing the portrait by Jody Clark have been seen in circulation. The original reverse of the coin, designed by Christopher Ironside, and used from 1968 to 2008, is a crowned lion (formally, Part of the crest of England, a lion passant guardant royally crowned), with the numeral "10" below the lion, and either NEW PENCE (1968–1981) or TEN PENCE (1982–2008) above the lion. In August 2005 the Royal Mint launched a competition to find new reverse designs for all circulating coins apart from the £2 coin. The winner, announced in April 2008, was Matthew Dent, whose designs were gradually introduced into the circulating British coinage from mid-2008. The designs for the 1p, 2p, 5p, 10p, 20p and 50p coins depict sections of the Royal Shield that form the whole shield when placed together. The shield in its entirety is featured on the £1 coin. 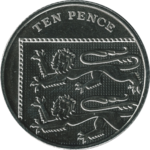 The 10p coin depicts the first quarter of the shield, showing the lions passant from the Royal Banner of England, with the words TEN PENCE above the shield design. The coin's obverse remains largely unchanged, but the beading (the ring of dots around the coin's circumference), which no longer features on the coin's reverse, has also been removed from the obverse. In March 2018, 26 new designs were released, one for each letter of the alphabet. Anne Jessopp, chief executive of the Royal Mint, described the designs as "iconic themes that are quintessentially British". ^ Bignell, C P. "Post decimalisation". Retrieved 2006-05-23. ^ "Cupro Nickel Replacement Programme". Royal Mint. 2013. ^ "Mintage Figures". Royal Mint. Retrieved 28 December 2015. ^ Clayton, Tony. 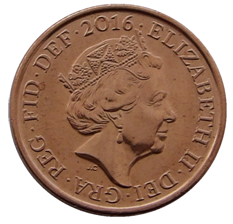 "Decimal Coins of the UK – Bronze". Retrieved 2006-05-24. ^ a b c "1p Coin". British Royal Mint. Archived from the original on 2006-04-27. Retrieved 2006-05-23. ^ "Where can I get a new alphabet 10p coin?". The Sun. 1 March 2018. Retrieved 1 March 2018. ^ "Silver A to Z Coins - Great British Coin Hunt by The Royal Mint". www.royalmint.com. Retrieved 2 March 2018. ^ Boyce, Lee. "Great British 10p hunt! Royal Mint reveals 26 new coins will be made". This is Money. Retrieved 1 March 2018. The British decimal halfpenny coin was introduced in February 1971, at the time of decimalisation, and was worth one two-hundredth of a pound sterling. It was ignored in banking transactions, which were carried out in units of 1p. 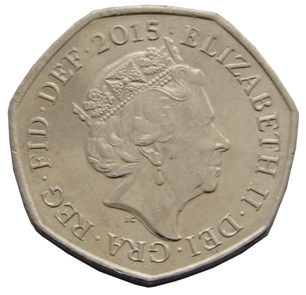 The British one pound (£1) coin is a denomination of the pound sterling. 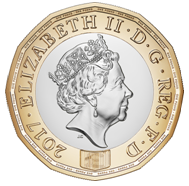 Its obverse bears the Latin engraving ELIZABETH II D G REG “Dei Gratia Regina” meaning, “Elizabeth II, by the grace of God, Queen” and F D meaning Fidei defensor, Defender of the Faith. It has featured the profile of Queen Elizabeth II since the original coin's introduction on 21 April 1983. Four different portraits of the Queen have been used, with the latest design by Jody Clark being introduced in 2015. The design on the reverse side of the current, 12-sided coin features four emblems to represent each of the nations of the United Kingdom – the English rose, the leek for Wales, the Scottish thistle, and the shamrock for Northern Ireland – emerging from a single stem within a crown. The shilling (1s) coin was a subdivision of the pre-decimal Irish pound, worth ​1⁄20 of a pound. The sixpence, sometimes known as a tanner or sixpenny bit, is a coin that was worth one-fortieth of a pound sterling, or six pence. It was first minted in the reign of Edward VI and circulated until 1980. Following decimalisation in 1971 it had a value of ​2 1⁄2 new pence. The coin was made from silver from its introduction in 1551 to 1947, and thereafter in cupronickel. The Australian ten-cent coin is a coin of the decimal Australian dollar. When the dollar was introduced as half of an Australian pound on 14 February 1966, the coin inherited the specifications of the pre-decimal shilling; both coins were worth one twentieth of a pound. On introduction it was the fourth-lowest denomination coin. Since the withdrawal from circulation of the one and two cent coins in 1992, it has been the second-lowest denomination coin in circulation.